It's fall but we had a day that still felt like summer so I thought I'd wear my summery printed skirt one more time. I paired it with hot pink. Shirt- JcPenney (similar), Skirt- J. Crew Factory (exact, tunic, top, dress), Shoes- Sam Edelman (same style, steal), Purse- Coach (steal), Earrings- Back East Boutique (similar)I get commission for purchases or clicks made through links in this post. How fun! I love all of the colors and am a fan of pink myself. Such fun colors! 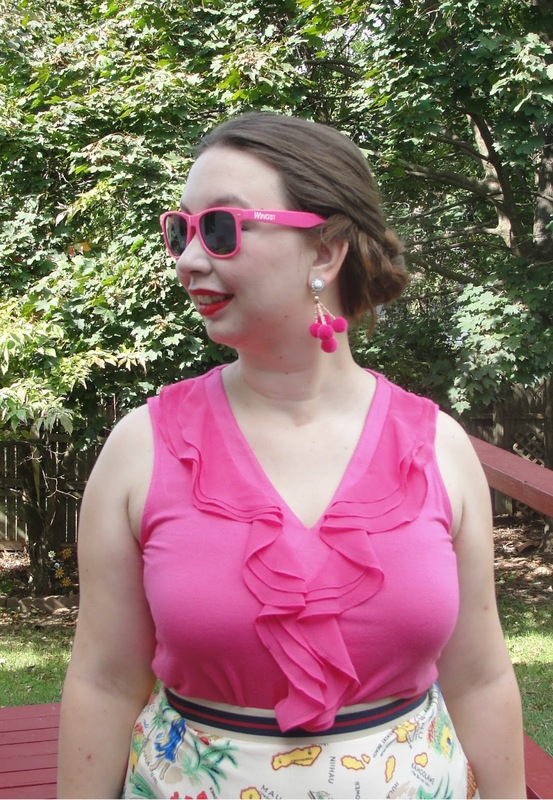 Pink is a color that seems to be trending for fall! Love the hot pink top! In love with your skirt! The pink tank is perfect with it! I love the hot pink with that fun printed skirt. I've been wanting to wear all my warm weather stuff before it's too late too! Love the hot pink on you! So cute! What a gorgeous outfit!!! I LOVE that gorgeous vibrant shade of pink and the ruffles on your wonderfully feminine blouse! 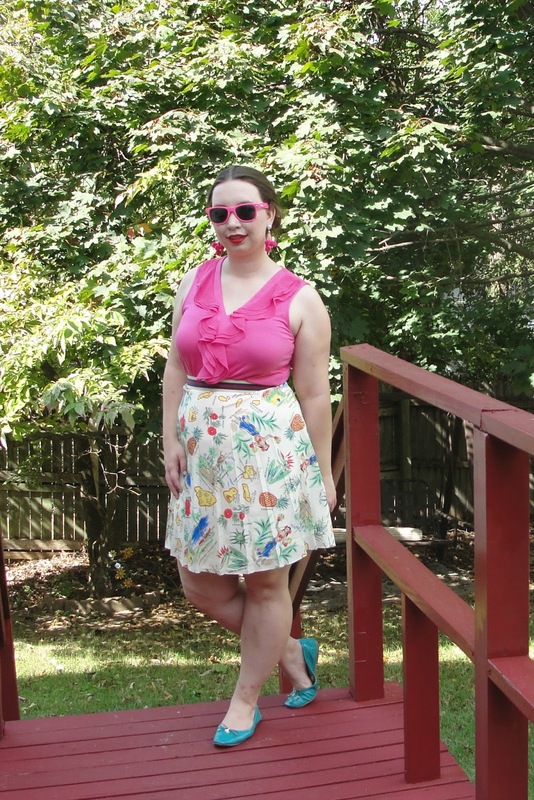 I also love the fun print on your pretty pleated skirt. I'm amazed at the excellent colour match of the frames of the coordinating sunnies with the blouse! What a fun skirt! I love the hot pink, too! 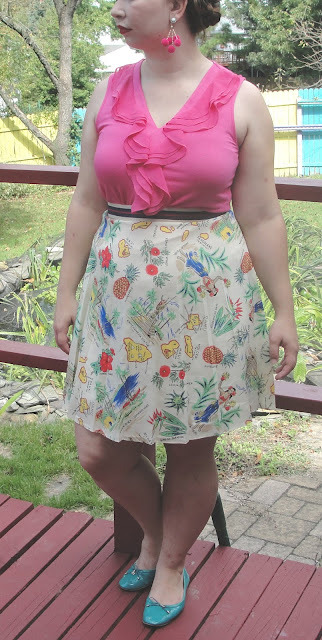 I've been trying to work in those summer pieces one last time, too! Love the pink here! Hey, Read my testimony! Getting ex back after a breakup. My boyfriend of a 2 year just broke up with me and am 28 weeks pregnant. I have cried myself to sleep most of the nights and don’t seem to concentrate during lectures sometimes I stay awake almost all night thinking about him and start to cry all over again. Because of this I end up not having energy for my next day’s classes, my attendance has dropped and am always in uni and on time. Generally he is a very nice guy, he ended it because he said we were arguing a lot and not getting along. He is right we've been arguing during the pregnancy a lot. After the break up I kept ringing him and telling him I will change. I am in love with this guy and he is the best guy I have ever been with. I’m still hurt and in disbelief when he said he didn't have any romantic feelings towards me anymore that hurt me faster than a lethal syringe. He texts me once and then mainly to check up on how am doing with the pregnancy, he is supportive with it but it’s not fair on me, him texting me as I just want to grieve the pain and not have any stress due to the pregnancy. I was really upset and I needed help, so I searched for help online and I came across a website that suggested that Dr Ahmed can help solve marital problems, restore broken relationships and so on. So I felt I should give him a try. I contacted him and he told me what to do and I did it then he did a spell for me. 28 hours later, my boyfriend came to me and apologized for the wrongs he did and promise never to do it again. Ever since then, everything has returned back to normal. I and my boyfriend are living together happily again.. All thanks to Dr Ahmed. as it is a place to resolve marriage/relationship issues, do you want to be sure if your spouse is being faithful to you or Do you want your Ex to come back to you Contact. : E-mail: Ahmedutimate@gmail.com call him on: +2348160153829 save your crumbling home. I suggest you contact him. He will not disappoint you.